You don’t need to be a fan of celebrity culture to find interest in the connections of famous people with your home area. The New Forest has its share of well-known names with intriguing links. TV presenter Esther Rantzen, naturalist and broadcaster Chris Packham, motor racing commentator Murray Walker and film critic Mark Kermode are among those whose local connections are often highlighted today, but I am thinking of figures from the past. The creator of Sherlock Holmes, author Sir Arthur Conan Doyle (1869-1930), has connections with several other parts of the country but he is buried in Minstead churchyard. He bought a house in the village late in his life as a holiday home and set parts of his novel The White Company in the New Forest. Alice Liddell, the inspiration for Lewis Carroll’s Alice in Alice’s Adventures in Wonderland, lived in Lyndhurst at a house called Cuffnells. 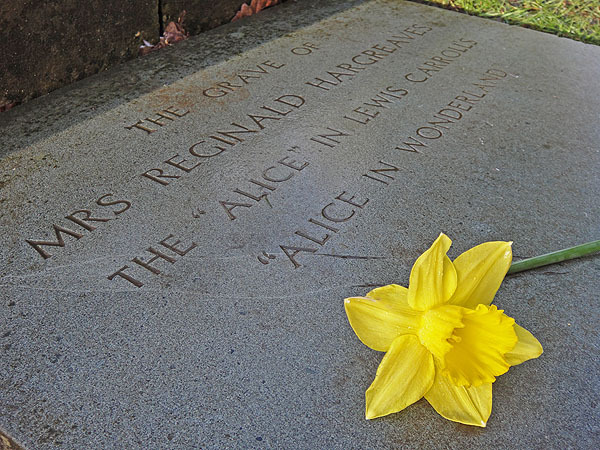 She is buried in Lyndhurst churchyard and the mirror from her house – in one sense Alice’s looking-glass – can be seen at the New Forest Centre in Lyndhurst. The artist Augustus John worked and died in Fordingbridge (1928-1961) and is remembered with an impressive statue. Surprisingly Florence Nightingale, renowned for her nursing work in the Crimean War and beyond, is buried in St Margaret’s churchyard at East Wellow. Sir Christopher Cockerill, inventor of the hovercraft, lived in Hythe. T. E. Lawrence, better known as Lawrence of Arabia, also spent time during his military service in Hythe and at Calshot where one of the buildings is named after him and bears a small commemorative plaque. William Gilpin, remembered as an artist, writer and reformer, was vicar of St John the Baptist Church at East Boldre from 1777 to 1804. He is buried there and has a memorial. His Remarks on Forest Scenery focuses on the area. The poet Robert Southey was married in Boldre Church too. Hymn-writer Henry Lyte (1793-1847) wrote ‘Praise my soul, the King of Heaven’ and ‘Abide with me’ while he was curate at the Church of St Thomas in Lymington. One of the best-known Forest figures is the most local: Harry ‘Brusher’ Mills (1840-1905), the so-called ‘snakecatcher’. He lived in an old charcoal burner’s hut and made his living from catching snakes for sale to London Zoo. He is buried in St Nicholas churchyard, Brockenhurst, and has a nearby pub named after him. The New Forest does not have a single, dominant figure associated with it in the way that Thomas Hardy or Catherine Cookson are linked with their geographical areas, but it does enjoy some quirky connections that can add interest to a day out.